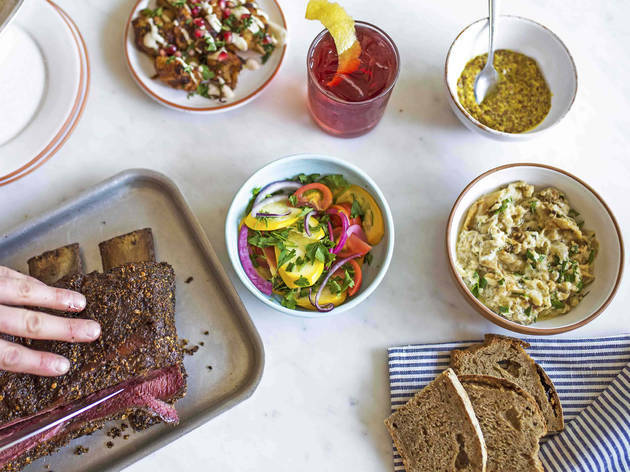 Last year a trendy brunch spot called Bad Egg opened in the City. This one is no relation and doesn’t have much to do with eggs – but it is good, very good. 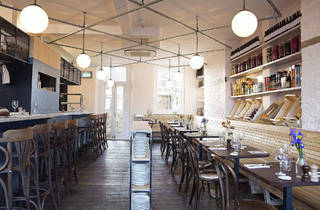 From the slatted bench that runs round one wall, it’s interesting to sit and contemplate what an efficient job the owners have done with a small space – it’s compact but not packed, stylish but not slavishly so, with an open kitchen, bar, high stools and central service stations all fitted in. A bit of uncertain service was forgiven on this early-days visit, especially once the food started arriving. 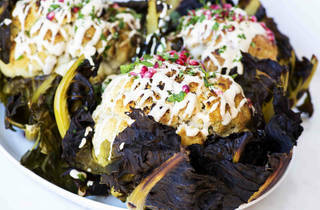 ‘Plates’ are Middle Eastern-influenced, a real trend at the moment, but it’s convincing. Preserved lemon and feta came on cocktail sticks in a tapas dish, sprinkled with fiery flaked chilli, an update of that ’70s party-nibble favourite cheddar and pineapple. An Iraqi pita had fried aubergine, chopped egg and mango pickle inside airy bread; best of all was za’atar fried chicken – spicy, crunchy and practically competition for your local Chicken Cottage at £5.50. (Everything’s good value – two of us left full after a couple of drinks each for less than £50.) 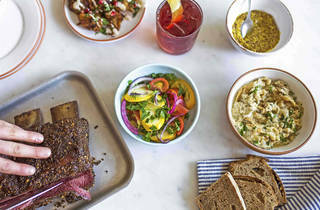 There are bigger dishes like Persian smoked brisket or whole roast cauliflower with tahini and pomegranate. It’s open all day, with tempting-looking breakfasts ensuring this little space will before long be full morning to night. 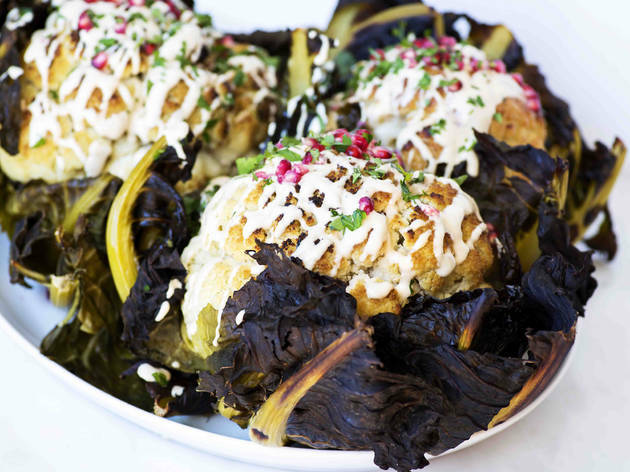 In a city where too often a new restaurant opening leaves us scratching our heads wondering ‘What were they thinking?’, Good Egg seems to have cracked it. Great place to go for brunch especially on a sunny day as there is a little courtyard in the back. Shakshuka reminded me of being back in Israel. The cocktails were a bit strong but tasty. Definitely coming back here again! The one near Picadilly had very unevenly seasoned food. 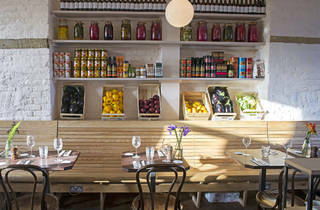 Such a stand out cafe in Stoke Newington! Has a great vibe, interesting menu and of course delicious food! Definitely lives up to the hype! Also there was no line around 2pm on a Saturday, walked straight in. Can’t wait to go back to try more! Absolutely loved my brunch here. One of the best shakshukas I've had to date, and their babka definitely meets the hype. The daily changing flavours mean I am always desperate to walk by and grab a piece when I can, and find out what's just coming out the oven! The filled pita are pretty great as well. All in all, a fantastic restaurant! Eggsellent!!! And does the best Bloody Mary in London no less. This place is the purfect cure to brunch boredom. The menu is mouthwatering and surprising. Be prepared to queue but it's worth it. The Good Egg is clearly very popular. Even on a very rainy Wednesday at lunch time it was nearly full. The restaurant is nice but also comfortable with a wooden booth running around half of the room. The other half is an open concept kitchen. There are also little patios out front and back which would be great for when the weather cooperates. The menu offers so many middle eastern delicacies - it was really difficult to narrow down my order! There were lots of little small plates you could order to make up your meal as well as about eight main sized dishes to choose from. I had the vegetarian pita with egg, fried aubergine, pickles and loads more. It was absolutely delicious and looked beautiful on the plate too. I really need to go back as there were so many other things I would still like to try. It was a sunny Monday and my friends birthday so after witnessing many queues here we thought a Monday brunch here would be fine. However we got the last table! Phew. I opted for a newer dish called Noodle Kugel, it's basically custard baked noodles with raisins, maple syrup and sour cream. I added crispy bacon. It was delicious! Something a little different to my normal eggs and really had a quick sweet and savoury kick. I had a great latte as well and I am pretty fussy with my lattes. Service was ok, it wasn't the best and they didn't seem to easy to accommodate a pram until we made a suggestion. Price wise again it's typical London brunch prices from £8 up for the average dish. The Good Egg does have some great brunch options and they do try to make the menu for both drinks and food different. Went for brunch, this landed in front of me - how can you not smile?! Very good egg indeed. Hotter & healthier than Ryan Gosling spread on avocado toast. 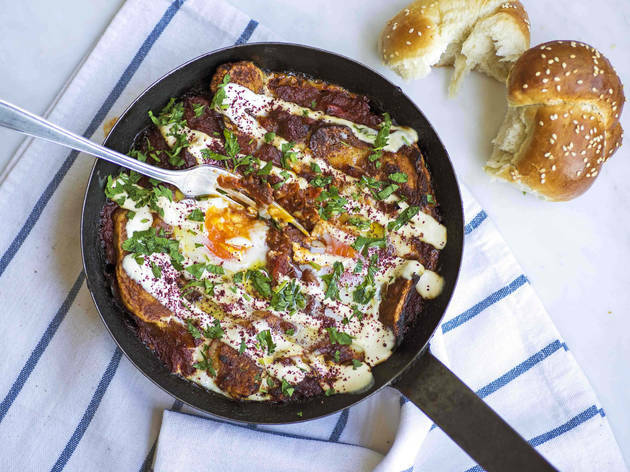 That would be the holy grail of breakfasting in London so when it comes time to chow down that first meal of the day, head to Stoke Newington and stake your place at The Good Egg. 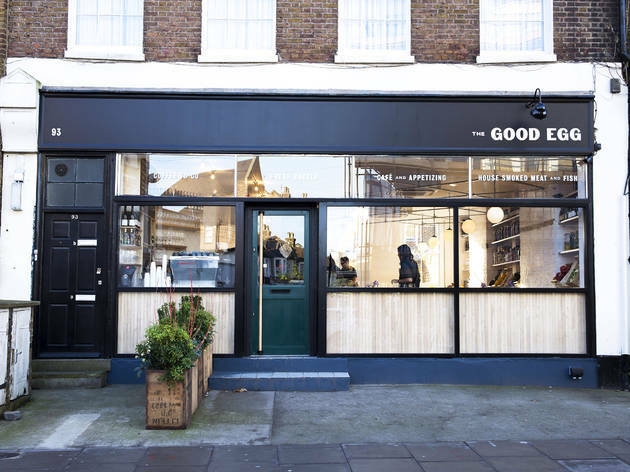 Nonchalantly confident with an understatedly cool exterior, this spot on Stoke Newington Church Street is having a bit of a moment and deservedly so. 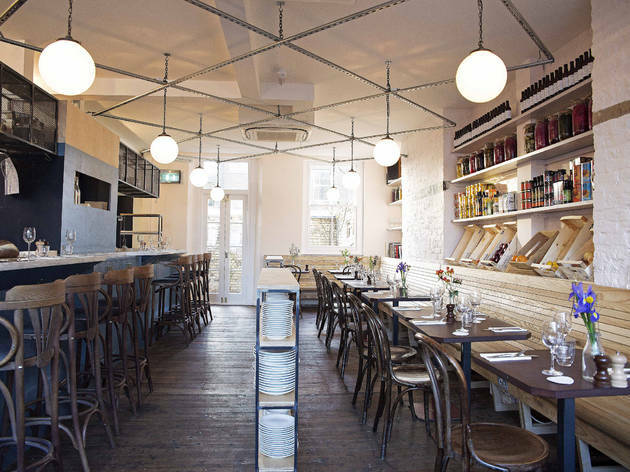 The former pop up is currently one of the tastiest tickets in town and within thirty minutes of a 9am Tuesday morning arrival, every table was full. 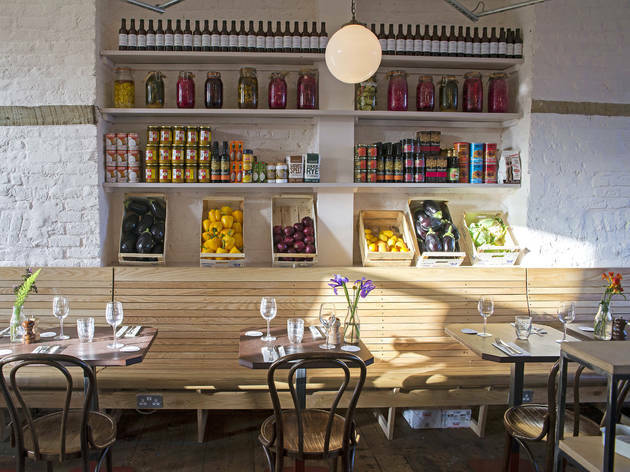 Whitewashed walls are shelved and heavy with preserved lemons, sacks of grain and jars of amba mango pickle while a slate-grey breakfast bar has platters of freshly baked apple & custard pastries piled next to babka loaves, thick with ribbons of chocolate & cinnamon. I’m a little bit in love with the menu’s Jewish-Israeli, traditional-modern take on everything in it; croissants are sweetly flavoured with halva and pitas are packed with aubergine, chilli’s & pickle. The Jerusalem Plate with silky, flaky Middle Eastern bourekas, creamy tahini, gorgeously sour pickles and deeply rich boiled eggs is utterly scrumptious but hands down, the Bacon & Date Pita with bacon, marbleized egg, date jam and amba mango pickle is my new favourite breakfast in London. Cloud light and dusty with flour, the pita is light years away from dry, creaky supermarket renditions, the chutney is sweet, sticky and satisfying and the amba mango pickle is sharp, tangy & smooth, banishing forever the cloying perfumed mango chutneys of your Friday night takeaway. My advice is get to the Good Egg soon and get there early. 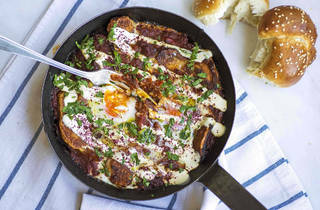 Be prepared to queue at the weekend but do so in the knowledge that it’s totally worth it…in a sea of overpriced and oversized breakfast plates that leave you staggering out in search of a bench and in need of a nap, Egg’s fresh & personal take on starting the day in Middle Eastern style is a breath of fresh air. The review is just for brunch. I am dying to come back for dinner. She said it was a bit of pepper overload (not spicy, just the amount) but I loved it! The halloumi was particularly flavourful in the sauce. Dinking a star for typical mediocre London service. A 40 minute wait to get seated on a Sunday, but well worth it for a tasty brunch in this lovely cafe. 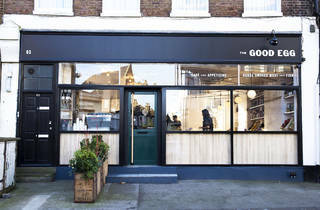 On trendy Church Street in Stoke Newington, the Good Egg serves delicious Middle eastern style food and great coffee. Shakshuka was to die for, and with so many scrumptious looking options on the menu, I'm going to be coming back regularly. This place is super tasty. Had to wait 40 minutes to get in but was worth it. The pork belly breakfast was extravagant but really really good, and nice to have something a little different to the usual brunch options. Friends had the eggs/chorizo which apparently looked better than it tasted. Place has a nice vibe though if your happy to wait to get in! It is a lovely, relaxed cafe, a little off the beaten path for me, for which i wouldn't mind the occasional commute to have that delicious chocolate babka.